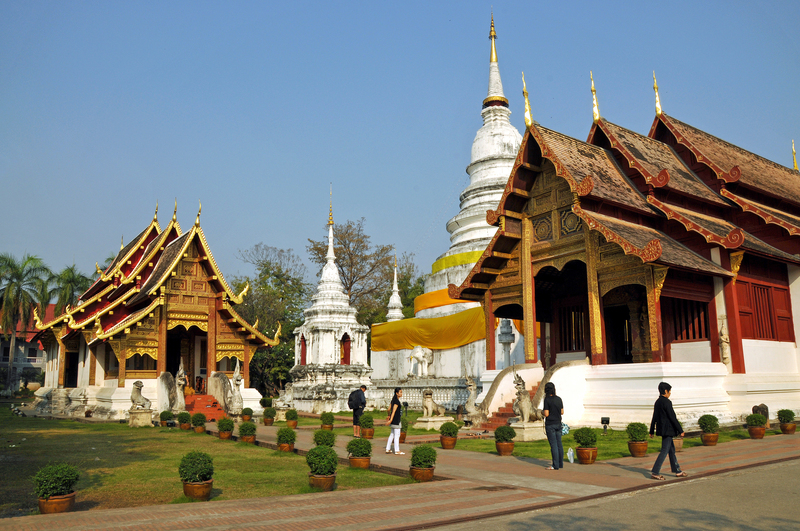 Walk around the grounds of a 14th-century Buddhist temple at Wat Phra Singh. With impressive buildings setting an atmosphere of royalty and reverence, this site has been officially deemed a temple of the first grade since 1935. An ornate Buddha statue reputedly from Ceylon, with a complex and rather mysterious history, takes pride of place in the main temple building. Admire the delicate artistry of the many murals and the simple beauty of the quiet grounds as the monks go about their daily routine. By using our Chiang Mai trip itinerary builder website , you can arrange your visit to Wat Phra Singh and other attractions in Chiang Mai. Beautiful temple complex, definitely worth a visit. Charging foreigners an entrance fee is petty - it's only 20 baht but would have donated more if not compulsory. The smaller temple behind the main one is very nice and tranquil, if you want to pray or meditate it's a better choice. Nice to walk through, be respectful and dress appropriately. There are Buddhist monks and worshipers here. If you want to enter temples there is a 20 baht entrance fee for foreigners only. The area has quiet a few temples to look at and enter and they are beautifully decorated. Peaceful area, yet in the heart of the city. It's worth a visit if you want to get away from the hustle and bustle of Chiang Mai.